The ability to solve problems is a basic life skill and is essential to our day-to-day lives, at home, at school, and at work. We solve problems every day without really thinking about how we solve them. For example: it’s raining and you need to go to the store. What do you do? There are lots of possible solutions. Take your umbrella and walk. If you don't want to get wet, you can drive, or take the bus. You might decide to call a friend for a ride, or you might decide to go to the store another day. There is no right way to solve this problem and different people will solve it differently. 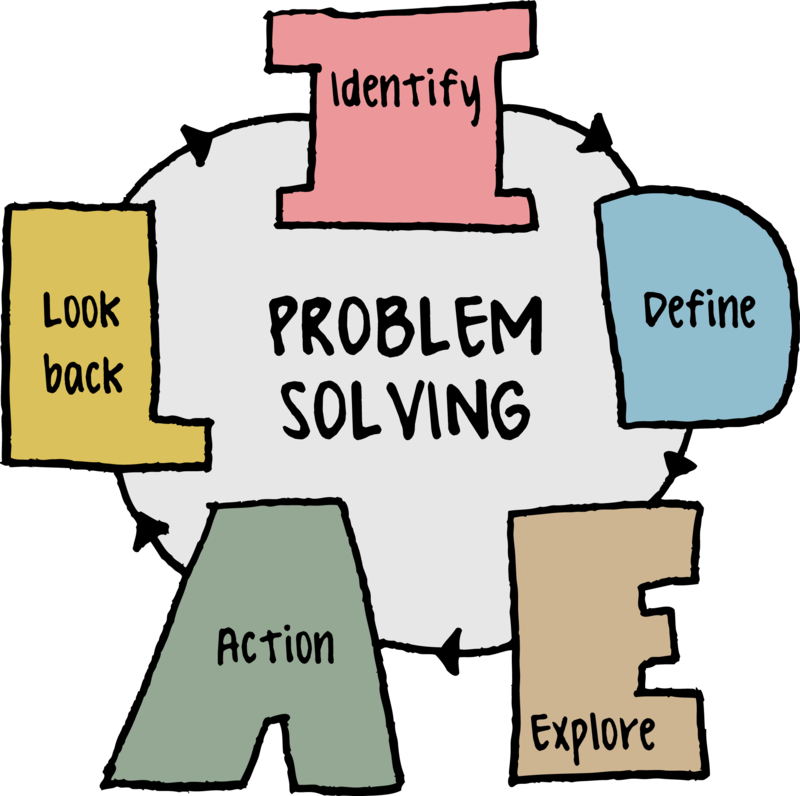 Problem solving is the process of identifying a problem, developing possible solution paths, and taking the appropriate course of action. Why is problem solving important? Good problem solving skills empower you not only in your personal life but are critical in your professional life. In the current fast-changing global economy, employers often identify everyday problem solving as crucial to the success of their organizations. For employees, problem solving can be used to develop practical and creative solutions, and to show independence and initiative to employers. Throughout this case study you will be asked to jot down your thoughts in idea logs. 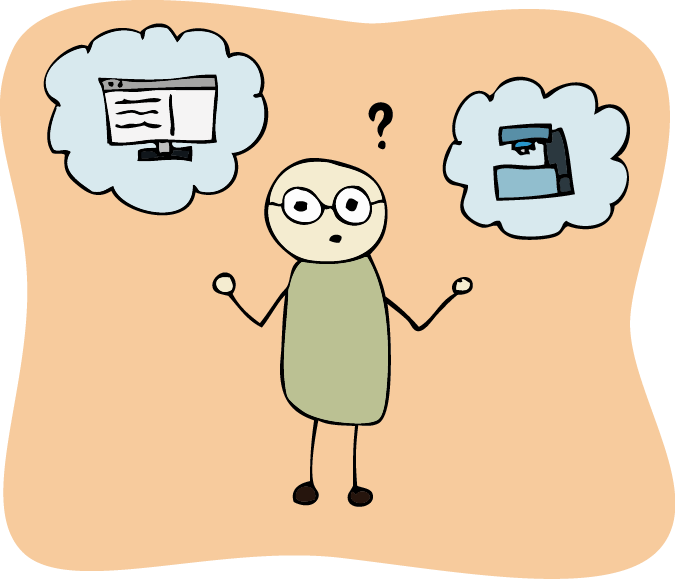 These idea logs are used for reflection on concepts and for answering short questions. When you click on the "Next" button, your responses will be saved for that page. If you happen to close the webpage, you will lose your work on the page you were on, but previous pages will be saved. At the end of the case study, click on the "Finish and Export to PDF" button to acknowledge completion of the case study and receive a PDF document of your idea logs. What Does Problem Solving Look Like? The ability to solve problems is a skill, and just like any other skill, the more you practice, the better you get. So how exactly do you practice problem solving? Learning about different problem solving strategies and when to use them will give you a good start. Problem solving is a process. Most strategies provide steps that help you identify the problem and choose the best solution. There are two basic types of strategies: algorithmic and heuristic. Algorithmic strategies are traditional step-by-step guides to solving problems. They are great for solving math problems (in algebra: multiply and divide, then add or subtract) or for helping us remember the correct order of things (a mnemonic such as “Spring Forward, Fall Back” to remember which way the clock changes for daylight saving time, or “Righty Tighty, Lefty Loosey” to remember what direction to turn bolts and screws). Algorithms are best when there is a single path to the correct solution. IDEAL is just one problem solving strategy. Building a toolbox of problem solving strategies will improve your problem solving skills. With practice, you will be able to recognize and use multiple strategies to solve complex problems. What is the best way to get a peanut out of a tube that cannot be moved? Watch a chimpanzee solve this problem in the video below [Geert Stienissen, 2010]. Describe the series of steps you think the chimpanzee used to solve this problem. [Page 2: What does Problem Solving Look Like?] Describe the series of steps you think the chimpanzee used to solve this problem. Think of an everyday problem you've encountered recently and describe your steps for solving it. [Page 2: What does Problem Solving Look Like?] Think of an everyday problem you've encountered recently and describe your steps for solving it. Problem solving is a process that uses steps to solve problems. But what does that really mean? Let's break it down and start building our toolbox of problem solving strategies. What is the first step of solving any problem? The first step is to recognize that there is a problem and identify the right cause of the problem. This may sound obvious, but similar problems can arise from different events, and the real issue may not always be apparent. To really solve the problem, it's important to find out what started it all. This is called identifying the root cause. Example: You and your classmates have been working long hours on a project in the school's workshop. The next afternoon, you try to use your student ID card to access the workshop, but discover that your magnetic strip has been demagnetized. Since the card was a couple of years old, you chalk it up to wear and tear and get a new ID card. Later that same week you learn that several of your classmates had the same problem! After a little investigation, you discover that a strong magnet was stored underneath a workbench in the workshop. The magnet was the root cause of the demagnetized student ID cards. The best way to identify the root cause of the problem is to ask questions and gather information. If you have a vague problem, investigating facts is more productive than guessing a solution. Ask yourself questions about the problem. What do you know about the problem? What do you not know? When was the last time it worked correctly? What has changed since then? Can you diagram the process into separate steps? Where in the process is the problem occurring? Be curious, ask questions, gather facts, and make logical deductions rather than assumptions. Watch Adam Savage from Mythbusters, describe his problem solving process [ForaTv, 2010]. As you watch this section of the video, try to identify the questions he asks and the different strategies he uses. Adam Savage shared many of his problem solving processes. List the ones you think are the five most important. Your list may be different from other people in your class—that's ok! [Page 3: Developing Problem Solving Processes] Adam Savage shared many of his problem solving processes. List the ones you think are the five most important. In manufacturing facilities and machine shops, everyone on the floor is expected to know how to identify problems and find solutions. Today's employers look for the following skills in new employees: to analyze a problem logically, formulate a solution, and effectively communicate with others. In this video, industry professionals share their own problem solving processes, the problem solving expectations of their employees, and an example of how a problem was solved. Taconic High School in Pittsfield, Massachusetts, is a comprehensive, fully accredited high school with special programs in Health Technology, Manufacturing Technology, and Work-Based Learning. Berkshire Community College in Pittsfield, Massachusetts, prepares its students with applied manufacturing technical skills, providing hands-on experience at industrial laboratories and manufacturing facilities, and instructing them in current technologies. H.C. Starck in Newton, Massachusetts, specializes in processing and manufacturing technology metals, such as tungsten, niobium, and tantalum. In almost 100 years of experience, they hold over 900 patents, and continue to innovate and develop new products. Nypro Healthcare in Devens, Massachusetts, specializes in precision injection-molded healthcare products. They are committed to good manufacturing processes including lean manufacturing and process validation. Now that you have a couple problem solving strategies in your toolbox, let's practice. In this exercise, you are given a scenario and you will be asked to decide what steps you would take to identify and solve the problem. Scenario: You are a new employee and have just finished your training. 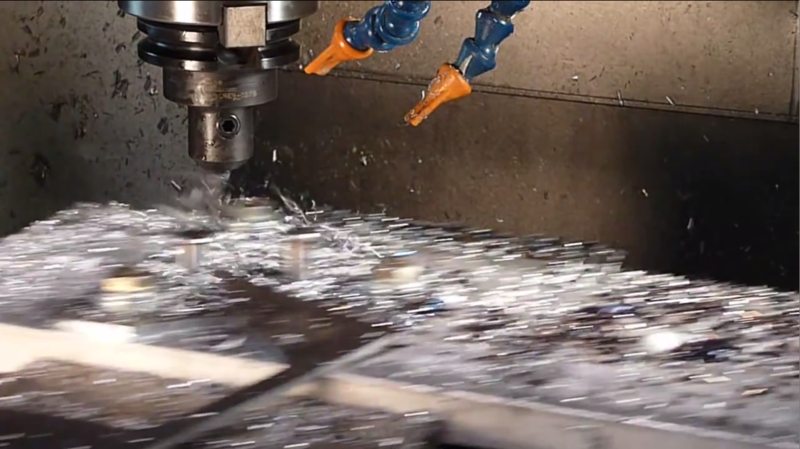 As your first project, you have been assigned the milling of several additional components for a regular customer. Together, you and your trainer, Bill, set up for the first run. Checking your paperwork, you gather the tools and materials on the list. As you are mounting the materials on the table, you notice that you didn't grab everything and hurriedly grab a few more items from one of the bins. Once the material is secured on the CNC table, you load tools into the tool carousel in the order listed on the tool list and set the fixture offsets. Bill tells you that since this is a rerun of a job several weeks ago, the CAD/CAM model has already been converted to CNC G-code. 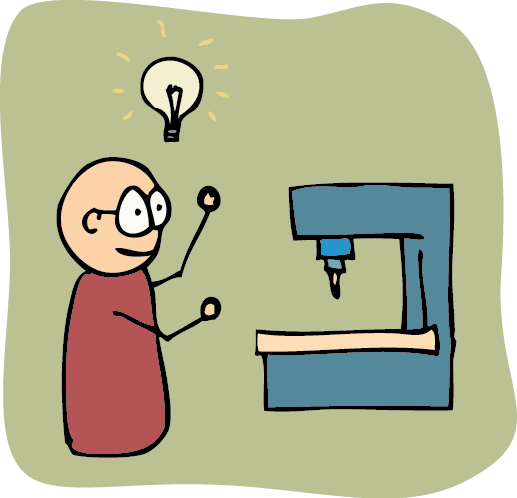 Bill helps you download the code to the CNC machine. He gives you the go-ahead and leaves to check on another employee. You decide to start your first run. What problems did you observe in the video? [Page 5: Making Decisions] What problems did you observe in the video? [Decision Tree Step1] What do you do next? Ask your trainer for help. As you are cleaning up, you think about what happened and wonder why it happened. You try to create a mental picture of what happened. You are not exactly sure what the end mill hit, but it looked like it might have hit the dowel pin. You wonder if you grabbed the correct dowel pins from the bins earlier. You can think of two possible next steps. You can recheck the dowel pin length to make sure it is the correct length, or do a dry run using the CNC single step or single block function with the spindle empty to determine what actually happened. Which one do you try? [Decision Tree Step2 Option1] You can think of two possible solutions. Which one do you try? Use the single step/single block function to determine what happened. You notice that your trainer, Bill, is still on the floor and decide to ask him for help. You describe the problem to him. Bill asks if you know what the end mill ran into. You explain that you are not sure but you think it was the dowel pin. Bill reminds you that it is important to understand what happened so you can fix the correct problem. He suggests that you start all over again and begin with a dry run using the single step/single block function, with the spindle empty, to determine what it hit. Or, since it happened at the end, he mentions that you can also check the G-code to make sure the Z-axis is raised before returning to the home position. Run the single step/single block function. Edit the G-code to raise the Z-axis. You finish cleaning up and check the CNC for any damage. Luckily, everything looks good. You check your paperwork and gather the components and materials again. You look at the dowel pins you used earlier, and discover that they are not the right length. As you go to grab the correct dowel pins, you have to search though several bins. For the first time, you are aware of the mess - it looks like the dowel pins and other items have not been put into the correctly labeled bins. You spend 30 minutes straightening up the bins and looking for the correct dowel pins. Finally finding them, you finish setting up. You load tools into the tool carousel in the order listed on the tool list and set the fixture offsets. Just to make sure, you use the CNC single step/single block function, to do a dry run of the part. Everything looks good! You are ready to create your first part. The first component is done, and, as you admire your success, you notice that the part feels hotter than it should. You wonder why? You go over the steps of the process to mentally figure out what could be causing the residual heat. You wonder if there is a problem with the CNC's coolant system or if the problem is in the G-code. [Decision Tree Step3 Option1A] It seems that you have fixed the problem. What do you do next? After thinking about the problem, you decide that maybe there's something wrong with the setup. First, you clean up the damaged materials and remove the broken tool. You check the CNC machine carefully for any damage. Luckily, everything looks good. It is time to start over again from the beginning. You again check your paperwork and gather the tools and materials on the setup sheet. After securing the new materials, you use the CNC single step/single block function with the spindle empty, to do a dry run of the part. You watch carefully to see if you can figure out what happened. It looks to you like the spindle barely misses hitting the dowel pin. You determine that the end mill was broken when it hit the dowel pin while returning to the start position. [Decision Tree Step3 Option 1B] You get it partially right. What do you do next? After conducting a dry run using the single step/single block function, you determine that the end mill was damaged when it hit the dowel pin on its return to the home position. You discuss your options with Bill. Together, you decide the best thing to do would be to edit the G-code and raise the Z-axis before returning to home. You open the CNC control program and edit the G-code. Just to make sure, you use the CNC single step/single block function, to do another dry run of the part. You are ready to create your first part. It works. You first part is completed. Only four more to go. As you are cleaning up, you notice that the components are hotter than you expect and the end mill looks more worn than it should be. It dawns on you that while you were milling the component, the coolant didn't turn on. You wonder if it is a software problem in the G-code or hardware problem with the CNC machine. It's the end of the day and you decide to finish the rest of the components in the morning. [Decision Tree Step3 Option2A] You repeat the solution, but you wonder why a similar problem is happening on multiple projects. You decide to look at the G-code in the morning. You leave a note on the machine, just in case. You decide that the best thing to do would be to edit the G-code and raise the Z-axis of the spindle before it returns to home. You open the CNC control program and edit the G-code. While editing the G-code to raise the Z-axis, you notice that the coolant is turned off at the beginning of the code and at the end of the code. The coolant command error caught your attention because your coworker, Mark, mentioned having a similar issue during lunch. You change the coolant command to turn the mist on. [Decision Tree Step3 Option2B] You wonder why a similar problem is happening on multiple projects. You decide to talk with your supervisor. You discuss what happened with a coworker over lunch. As you reflect on the residual heat problem, you think about the machining process and the factors that could have caused the issue. You try to think of anything and everything that could be causing the issue. Are you using the correct tool for the specified material? Are you using the specified material? Is it running at the correct speed? Is there enough coolant? Are there chips getting in the way? Wait, was the coolant turned on? As you replay what happened in your mind, you wonder why the coolant wasn't turned on. You decide to look at the G-code to find out what is going on. From the milling machine computer, you open the CNC G-code. You notice that there are no coolant commands. You add them in and on the next run, the coolant mist turns on and the residual heat issues is gone. Now, its on to creating the rest of the parts. Have you ever used brainstorming to solve a problem? Chances are, you've probably have, even if you didn't realize it. You notice that your trainer, Bill, is on the floor and decide to ask him for help. You describe the problem with the end mill breaking, and how you discovered that items are not being returned to the correctly labeled bins. You think this caused you to grab the incorrect length dowel pins on your first run. You have sorted the bins and hope that the mess problem is fixed. You then go on to tell Bill about the residual heat issue with the completed part. Together, you go to the milling machine. Bill shows you how to check the oil and coolant levels. Everything looks good at the machine level. Next, on the CNC computer, you open the CNC G-code. While looking at the code, Bill points out that there are no coolant commands. Bill adds them in and when you rerun the program, it works. Bill is glad you mentioned the problem to him. You are the third worker to mention G-code issues over the last week. You noticed the coolant problems in your G-code, John noticed a Z-axis issue in his G-code, and Sam had issues with both the Z-axis and the coolant. Chances are, there is a bigger problem and Bill will need to investigate the root cause. Talking with Bill, you discuss the best way to fix the problem. Bill suggests editing the G-code to raise the Z-axis of the spindle before it returns to its home position. You open the CNC control program and edit the G-code. Following the setup sheet, you re-setup the job and use the CNC single step/single block function, to do another dry run of the part. Everything looks good, so you run the job again and create the first part. It works. Since you need four of each component, you move on to creating the rest of them before cleaning up and leaving for the day. It's a new day and you have new components to create. As you are setting up, you go in search of some short dowel pins. You discover that the bins are a mess and components have not been put away in the correctly labeled bins. You wonder if this was the cause of yesterday's problem. As you reorganize the bins and straighten up the mess, you decide to mention the mess issue to Bill in your afternoon meeting. You describe the bin mess and using the incorrect length dowels to Bill. He is glad you mentioned the problem to him. You are not the first person to mention similar issues with tools and parts not being put away correctly. Chances are there is a bigger safety issue here that needs to be addressed in the next staff meeting. In any workplace, following proper safety and cleanup procedures is always important. This is especially crucial in manufacturing where people are constantly working with heavy, costly and sometimes dangerous equipment. When issues and problems arise, it is important that they are addressed in an efficient and timely manner. Effective communication is an important tool because it can prevent problems from recurring, avoid injury to personnel, reduce rework and scrap, and ultimately, reduce cost, and save money. You now know that the end mill was damaged when it hit the dowel pin. It seems to you that the easiest thing to do would be to edit the G-code and raise the Z-axis position of the spindle before it returns to the home position. You open the CNC control program and edit the G-code, raising the Z-axis. Starting over, you follow the setup sheet and re-setup the job. This time, you use the CNC single step/single block function, to do another dry run of the part. Everything looks good, so you run the job again and create the first part. At the end of the day, you are reviewing your progress with your trainer, Bill. After you describe the day's events, he reminds you to always think about safety and the importance of following work procedures. He decides to bring the issue up in the next morning meeting as a reminder to everyone. In any workplace, following proper procedures (especially those that involve safety) is always important. This is especially crucial in manufacturing where people are constantly working with heavy, costly, and sometimes dangerous equipment. When issues and problems arise, it is important that they are addressed in an efficient and timely manner. Effective communication is an important tool because it can prevent problems from recurring, avoid injury to personnel, reduce rework and scrap, and ultimately, reduce cost, and save money. One tool to improve communication is the morning meeting or huddle. The next morning, you check the G-code to determine what is wrong with the coolant. You notice that the coolant is turned off at the beginning of the code and also at the end of the code. This is strange. You change the G-code to turn the coolant on at the beginning of the run and off at the end. This works and you create the rest of the parts. Throughout the day, you keep wondering what caused the G-code error. At lunch, you mention the G-code error to your coworker, John. John is not surprised. He said that he encountered a similar problem earlier this week. You decide to talk with your supervisor the next time you see him. You are in luck. You see your supervisor by the door getting ready to leave. You hurry over to talk with him. You start off by telling him about how you asked Bill for help. Then you tell him there was a problem and the end mill was damaged. You describe the coolant problem in the G-code. Oh, and by the way, John has seen a similar problem before. Your supervisor doesn't seem overly concerned, errors happen. He tells you "Good job, I am glad you were able to fix the issue." You are not sure whether your supervisor understood your explanation of what happened or that it had happened before. The challenge of communicating in the workplace is learning how to share your ideas and concerns. If you need to tell your supervisor that something is not going well, it is important to remember that timing, preparation, and attitude are extremely important. It is the end of your shift, but you want to let the next shift know that the coolant didn't turn on. You do not see your trainer or supervisor around. You decide to leave a note for the next shift so they are aware of the possible coolant problem. You write a sticky note and leave it on the monitor of the CNC control system. CNC may have a coolant issues. Coolant did not turn on. How effective do you think this solution was? Did it address the problem? In this scenario, you discovered several problems with the G-code that need to be addressed. When issues and problems arise, it is important that they are addressed in an efficient and timely manner. Effective communication is an important tool because it can prevent problems from recurring and avoid injury to personnel. The challenge of communicating in the workplace is learning how and when to share your ideas and concerns. If you need to tell your co-workers or supervisor that there is a problem, it is important to remember that timing and the method of communication are extremely important. You are able to fix the coolant problem in the G-code. While you are glad that the problem is fixed, you are worried about why it happened in the first place. It is important to remember that if a problem keeps reappearing, you may not be fixing the right problem. You may only be addressing the symptoms. You decide to talk to your trainer. Bill is glad you mentioned the problem to him. You are the third worker to mention G-code issues over the last week. You noticed the coolant problems in your G-code, John noticed a Z-axis issue in his G-code, and Sam had issues with both the Z-axis and the coolant. Chances are, there is a bigger problem and Bill will need to investigate the root cause. Over lunch, you ask your coworkers about the G-code problem and what may be causing the error. Several people mention having similar problems but do not know the cause. You have now talked to three coworkers who have all experienced similar coolant G-code problems. You make a list of who had the problem, when they had the problem, and what each person told you. When you see your supervisor later that afternoon, you are ready to talk with him. You describe the problem you had with your component and the damaged bit. You then go on to tell him about talking with Bill and discovering the G-code issue. You show him your notes on your coworkers' coolant issues, and explain that you think there might be a bigger problem. You supervisor thanks you for your initiative in identifying this problem. It sounds like there is a bigger problem and he will need to investigate the root cause. He decides to call a team huddle to discuss the issue, gather more information, and talk with the team about the importance of communication. Fix the problem so it won’t happen again. 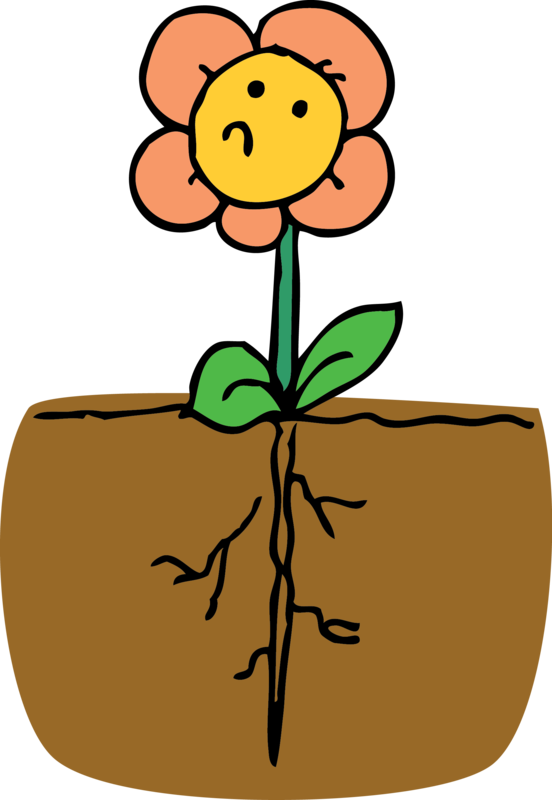 RCA works under the idea that systems and events are connected. An action in one area triggers an action in another, and another, and so on. By tracing back these actions, you can discover where the problem started and how it developed into the problem you're now facing. 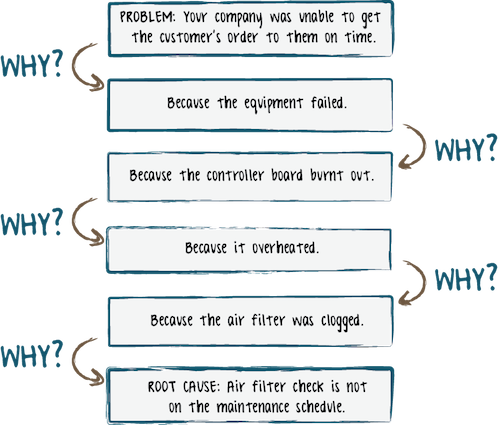 Root cause analysis can prevent problems from recurring, reduce injury to personnel, reduce rework and scrap, and ultimately, reduce cost and save money. 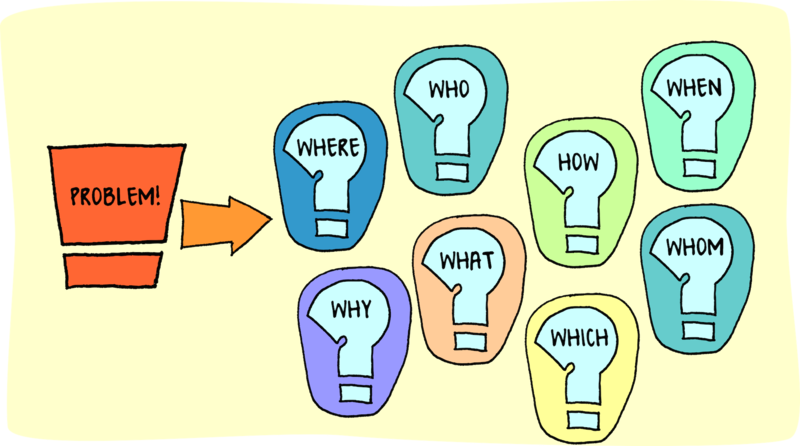 The 5 Whys Analysis technique involves repeatedly asking the question "Why?" and peeling away the layers of symptoms, leading to the root cause. Often, the answer to one question will lead you to another question. Although this technique is called "5 Whys," you may find that you will need to ask only 3 "Whys" or even 7 "Whys" before you find the core issue behind a problem. Communication is a vital part of any setting where people work together. Effective communication helps employees and managers form efficient teams. It builds trusts between employees and management, and reduces unnecessary competition because each employee knows how their part fits in the larger goal. One tool that management can use to promote communication in the workplace is the huddle. Just like football players on the field, a huddle is a short meeting where everyone is standing in a circle. A daily team huddle ensures that team members are aware of changes to the schedule, reiterated problems and safety issues, and how their work impacts one another. When done right, huddles create collaboration, communication, and accountability to results. Impromptu huddles can be used to gather information on a specific issue and get each team member's input. The most important thing to remember about huddles is that they are short, lasting no more than 10 minutes, and their purpose is to communicate and identify. In essence, a huddle’s purpose is to identify priorities, communicate essential information, and discover roadblocks to productivity. Brian Scudamore, CEO of 1-800-Got-Junk?, uses the daily huddle as an operational tool to take the pulse of his employees and as a motivational tool. Watch a morning huddle meeting . Fusion OEM, an outsourced manufacturing and production company. What do employees take away from the daily huddle meeting . Biz-Group, a performance consulting group. Tips for a successful huddle . One tool that can be useful in problem solving is brainstorming. Brainstorming is a creativity technique designed to generate a large number of ideas for the solution to a problem. The method was first popularized in 1953 by Alex Faickney Osborn in the book Applied Imagination . The goal is to come up with as many ideas as you can in a fixed amount of time. Although brainstorming is best done in a group, it can be done individually. Like most problem solving techniques, brainstorming is a process. Have an agreed a time limit. During the brainstorming session, write down everything that comes to mind, even if the idea sounds crazy. If one idea leads to another, write down that idea too. Combine and refine ideas into categories of solutions. Assess and analyze each idea as a potential solution. When used during problem solving, brainstorming can offer companies new ways of encouraging staff to think creatively and improve production. Brainstorming relies on team members' diverse experiences, adding to the richness of ideas explored. This means that you often find better solutions to the problems. Team members often welcome the opportunity to contribute ideas and can provide buy-in for the solution chosen—after all, they are more likely to be committed to an approach if they were involved in its development. What's more, because brainstorming is fun, it helps team members bond. Watch Peggy Morgan Collins, a marketing executive at Power Curve Communications discuss How to Stimulate Effective Brainstorming . Watch Kim Obbink, CEO of Filter Digital, a digital content company, and her team share their top five rules for How to Effectively Generate Ideas . Communication is one of the most frequent activities we engage in on a day-to-day basis. At some point, we have all felt that we did not effectively communicate an idea as we would have liked. The key to effective communication is preparation. Rather than attempting to haphazardly improvise something, take a few minutes and think about what you want say and how you will say it. If necessary, write yourself a note with the key points or ideas in the order you want to discuss them. The notes can act as a reminder or guide when you talk to your supervisor. Provide a clear summary of your problem. Start at the beginning, give relevant facts, timelines, and examples. Avoid including your opinion or personal attacks in your explanation. Avoid using words like "always" or "never," which can give the impression that you are exaggerating the problem. If this is an ongoing problem and you have collected documentation, give it to your supervisor once you have finished describing the problem. Remember to listen to what's said in return; communication is a two-way process. Not all communication is spoken. Body language is nonverbal communication that includes your posture, your hands and whether you make eye contact. These gestures can be subtle or overt, but most importantly they communicate meaning beyond what is said. When having a conversation, pay attention to how you stand. A stiff position with arms crossed over your chest may imply that you are being defensive even if your words state otherwise. Shoving your hands in your pockets when speaking could imply that you have something to hide. Be wary of using too many hand gestures because this could distract listeners from your message. The challenge of communicating in the workplace is learning how and when to share your ideas or concerns. If you need to tell your supervisor or co-worker about something that is not going well, keep in mind that good timing and good attitude will go a long way toward helping your case. Like all skills, effective communication needs to be practiced. Toastmasters International is perhaps the best known public speaking organization in the world. Toastmasters is open to anyone who wish to improve their speaking skills and is willing to put in the time and effort to do so. To learn more, visit Toastmasters International . Communication of problems and issues in any workplace is important, particularly when safety is involved. It is therefore crucial in manufacturing where people are constantly working with heavy, costly, and sometimes dangerous equipment. As issues and problems arise, they need to be addressed in an efficient and timely manner. Effective communication is an important skill because it can prevent problems from recurring, avoid injury to personnel, reduce rework and scrap, and ultimately, reduce cost and save money. There are many different ways to communicate: in person, by phone, via email, or written. There is no single method that fits all communication needs, each one has its time and place. In person: In the workplace, face-to-face meetings should be utilized whenever possible. Being able to see the person you need to speak to face-to-face gives you instant feedback and helps you gauge their response through their body language. 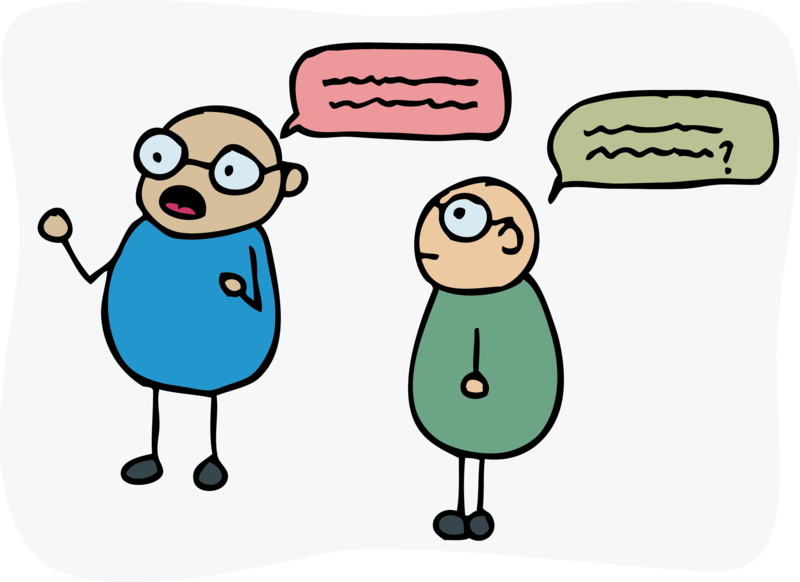 Be careful of getting sidetracked in conversation when you need to communicate a problem. Email: Email has become the communication standard for most businesses. It can be accessed from almost anywhere and is great for things that don’t require an immediate response. 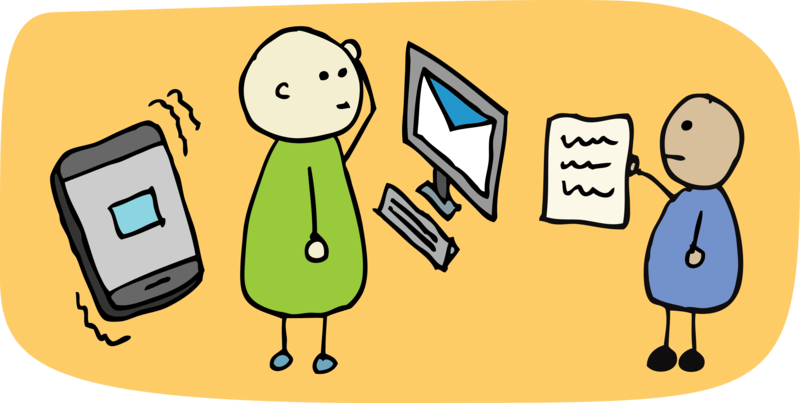 Email is a great way to communicate non-urgent items to large amounts of people or just your team members. One thing to remember is that most people's inboxes are flooded with emails every day and unless they are hyper vigilant about checking everything, important items could be missed. For issues that are urgent, especially those around safety, email is not always be the best solution. Phone: Phone calls are more personal and direct than email. They allow us to communicate in real time with another person, no matter where they are. 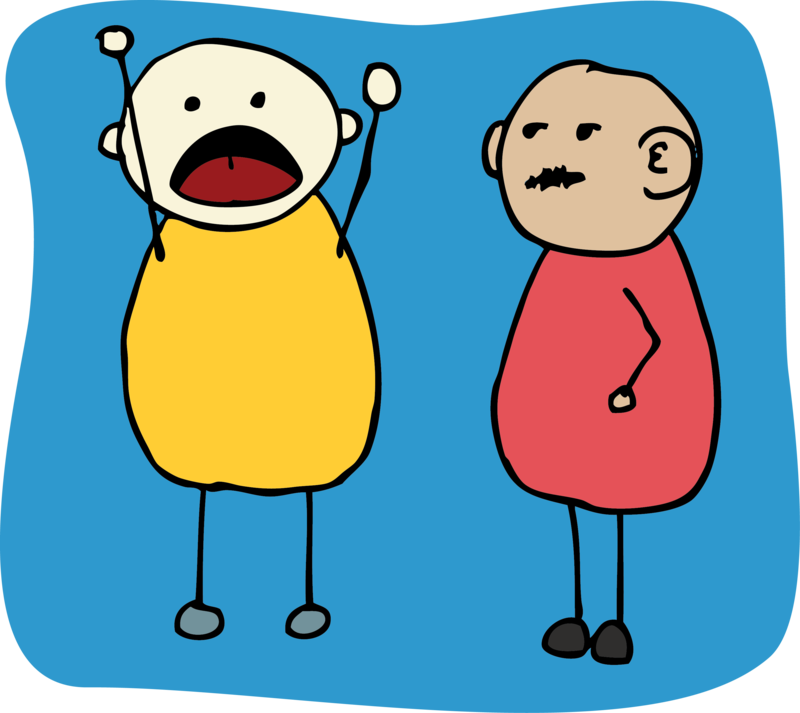 Not only can talking prevent miscommunication, it promotes a two-way dialogue. You don’t have to worry about your words being altered or the message arriving on time. However, mobile phone use and the workplace don't always mix. In particular, using mobile phones in a manufacturing setting can lead to a variety of problems, cause distractions, and lead to serious injury. Written: Written communication is appropriate when detailed instructions are required, when something needs to be documented, or when the person is too far away to easily speak with over the phone or in person. There is no "right" way to communicate, but you should be aware of how and when to use the appropriate form of communication for your situation. When deciding the best way to communicate with a co-worker or manager, put yourself in their shoes, and think about how you would want to learn about the issue. Also, consider what information you would need to know to better understand the issue. Use your good judgment of the situation and be considerate of your listener's viewpoint. Did you notice any other potential problems in the previous exercise? [Page 6:] Did you notice any other potential problems in the previous exercise? In this exercise, you were given a scenario in which there was a problem with a component you were creating on a CNC machine. You were then asked how you wanted to proceed. Depending on your path through this exercise, you might have found an easy solution and fixed it yourself, asked for help and worked with your trainer, or discovered an ongoing G-code problem that was bigger than you initially thought. When issues and problems arise, it is important that they are addressed in an efficient and timely manner. Communication is an important tool because it can prevent problems from recurring, avoid injury to personnel, reduce rework and scrap, and ultimately, reduce cost, and save money. Although, each path in this exercise ended with a description of a problem solving tool for your toolbox, the first step is always to identify the problem and define the context in which it happened. Once the underlying cause is identified and the scope of the issue defined, the next step is to explore possible strategies to fix the problem. If you are not sure how to fix the problem, it is okay to ask for help. Problem solving is a process and a skill that is learned with practice. It is important to remember that everyone makes mistakes and that no one knows everything. Life is about learning. It is okay to ask for help when you don’t have the answer. When you collaborate to solve problems you improve workplace communication and accelerates finding solutions as similar problems arise. 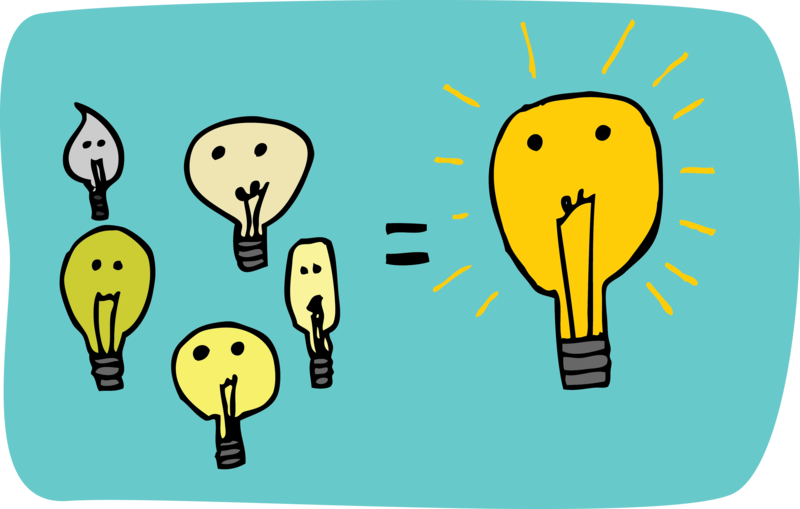 One tool that can be useful for generating possible solutions is brainstorming. Brainstorming is a technique designed to generate a large number of ideas for the solution to a problem. The method was first popularized in 1953 by Alex Faickney Osborn in the book Applied Imagination. The goal is to come up with as many ideas as you can, in a fixed amount of time. Although brainstorming is best done in a group, it can be done individually. Depending on your path through the exercise, you may have discovered that a couple of your coworkers had experienced similar problems. This should have been an indicator that there was a larger problem that needed to be addressed. In any workplace, communication of problems and issues (especially those that involve safety) is always important. This is especially crucial in manufacturing where people are constantly working with heavy, costly, and sometimes dangerous equipment. When issues and problems arise, it is important that they be addressed in an efficient and timely manner. Effective communication is an important tool because it can prevent problems from recurring, avoid injury to personnel, reduce rework and scrap, and ultimately, reduce cost and save money. One strategy for improving communication is the huddle. Just like football players on the field, a huddle is a short meeting with everyone standing in a circle. A daily team huddle is a great way to ensure that team members are aware of changes to the schedule, any problems or safety issues are identified and that team members are aware of how their work impacts one another. When done right, huddles create collaboration, communication, and accountability to results. 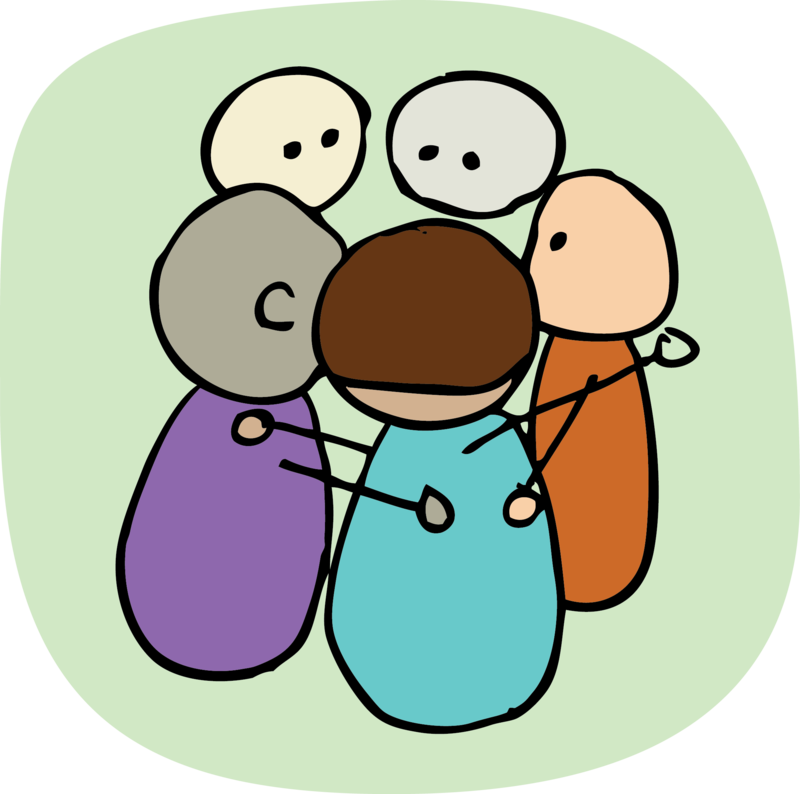 Impromptu huddles can be used to gather information on a specific issue and get each team member's input. To learn more about different problem solving strategies, choose an option below. These strategies accompany the outcomes of different decision paths in the problem solving exercise. Communication is one of the most frequent activities we engage in on a day-to-day basis. At some point, we have all felt that we did not effectively communicate an idea as we would have liked. The key to effective communication is preparation. Rather than attempting to haphazardly improvise something, take a few minutes and think about what you want say and how you will say it. If necessary, write yourself a note with the key points or ideas in the order you want to discuss them. The notes can act as a reminder or guide during your meeting. Provide a clear summary of the problem. Start at the beginning, give relevant facts, timelines, and examples. In person: In the workplace, face-to-face meetings should be utilized whenever possible. Being able to see the person you need to speak to face-to-face gives you instant feedback and helps you gauge their response in their body language. Be careful of getting sidetracked in conversation when you need to communicate a problem. There is no "right" way to communicate, but you should be aware of how and when to use the appropriate form of communication for the situation. When deciding the best way to communicate with a co-worker or manager, put yourself in their shoes, and think about how you would want to learn about the issue. Also, consider what information you would need to know to better understand the issue. Use your good judgment of the situation and be considerate of your listener's viewpoint. Problem solving improves efficiency and communication on the shop floor. It increases a company's efficiency and profitability, so it's one of the top skills employers look for when hiring new employees. Recent industry surveys show that employers consider soft skills, such as problem solving, as critical to their business’s success. The 2011 survey, "Boiling Point? The skills gap in U.S. manufacturing ," polled over a thousand manufacturing executives who reported that the number one skill deficiency among their current employees is problem solving, which makes it difficult for their companies to adapt to the changing needs of the industry. In this video, industry professionals discuss their expectations and present tips for new employees joining the manufacturing workforce. What are two things you learned in this case study? [Quick Summary: Question1] What are two things you learned in this case study? What question(s) do you still have about the case study? [Quick Summary: Question2] What question(s) do you still have about the case study? Is there anything you would like to learn more about with respect to this case study? [Quick Summary: Question3] Is there anything you would like to learn more about with respect to this case study? Enter your email below to receive your Idea Log automatically.